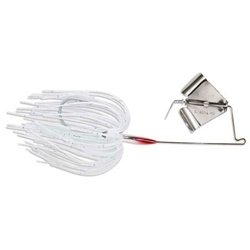 Terminator's Super Stainless Buzzbait gives you 47% more vibration than ordinary buzzbaits. The flat head design allows it to get up on top of the water quickly, much like a water ski, and stay on the surface even at a very slow retrieve. This Buzzbait's Super Stainless frame is 30% more than ordinary stainless-framed buzzbaits, offering topwater enthusiasts a tougher, more maintenance free buzzbait. Features Quickskirt changeable premium silicone skirt.